Samsung has today announced the all-new Galaxy Tab ’S’ tablets in two screen sizes i.e an 8.4-inch model and a 10.5-inch model, to rival the market leading iPad mini and iPad Air respectively. Both the Galaxy ‘S’ tablets sport 2560 x 1600 resolution Super AMOLED screens, and are aimed to be the company’s best among its numerous tablet offerings (via The Verge). 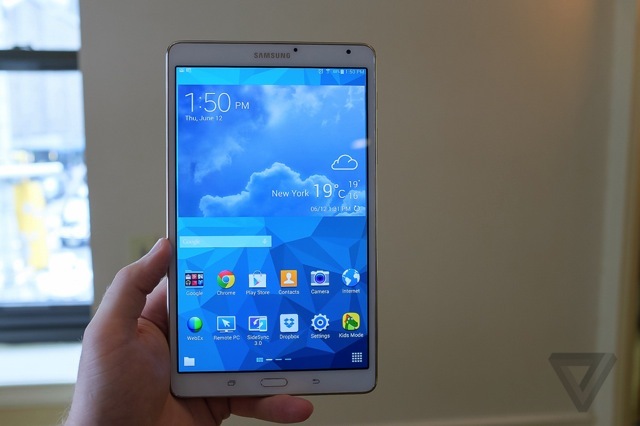 According to The Wall Street Journal’s initial hands-on of the new tablets, the two Galaxy Tab S tablets are basically Galaxy S5 devices with huge displays. Featuring the company’s new adaptive display tech, the tablets automatically adjust the brightness and contrast of the display on the fly in specific apps. 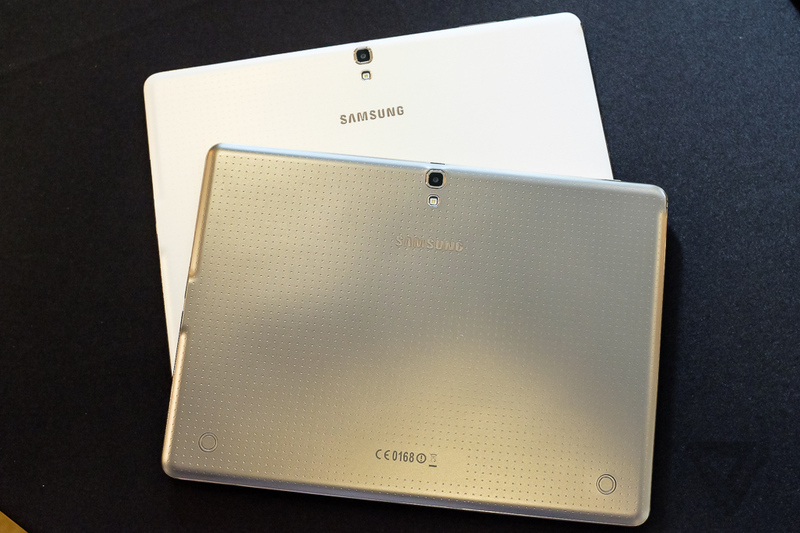 The tablets are also thinner, at 0.25 inches, than the iPads, and lighter as well. The 8.4-inch model weighs 10 ounces while its 10.5-inch sibling weighs just a pound, most likely because the rear is made up of Band-Aid patterned plastic like the company’s flagship Galaxy S5 smartphone. “This year, Samsung is putting a huge effort into convincing everyone that it cares about design, and the Tab S models carry the same “Modern Flash” design theme as the Galaxy S5. Samsung tells me that its designers were inspired by minimalist architecture when building the tablets and the goal is to attain “ultra sleekness and slimness.” In reality, they just look like giant Galaxy S5s, complete with the same dimpled finish on the back and fingerprint scanners on the front. 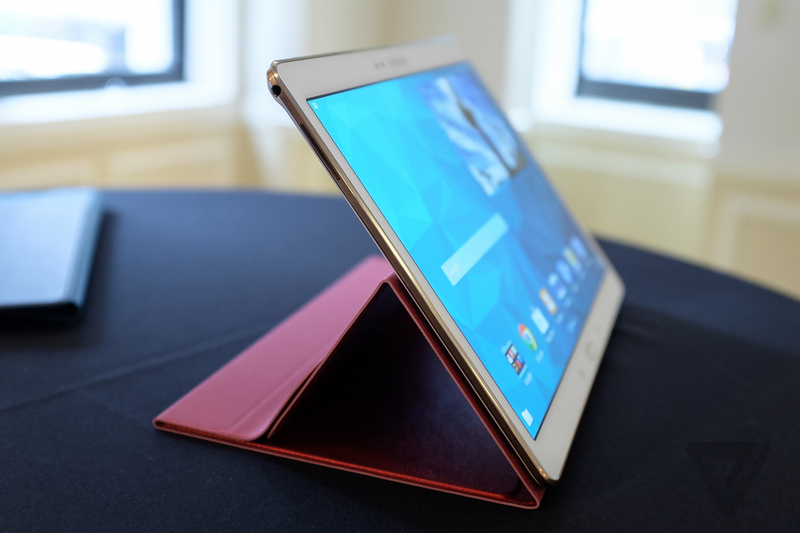 Available for pre-order on Friday, the 8.4-inch Tab S starts at $399 and the 10.5-inch model at $499. Both will ship in July.